Nowadays influencer marketing is getting more and more important for different brands and also for the influencers themselves. But the current question is, how you can calculate your success in exactly those kind of marketing ways? According to The 2019 State of Influencer Marketing Report, almost 80% of the brands say that they dedicated budget to influencer marketing. Also that by 2020, an estimated $8 billion is expected to be spent on Instagram influencer marketing alone. This shows us how important this kind of marketing is for brands and their companies and that it will get much more important when time goes by. So to control the return on investment in influencer marketing there are five simples steps given. Set campaign goals for accurate ROI tracking. Means: set goals which are clear and objective. So it will be easier for you to choose your types of control, platforms and of course the kind of influencer you want to work with. The most common end goals are the brand awareness, lead generation and direct sales. Define metrics to measure campaign performance. Your goals should be: specified, time lined and achievable. It is not necessary to pick a single metric. There are different metrics which can be included. For example the clicks, brand mentions, follower growth, brand engagement increase or the number of impressions. Develop goals and performance metrics for individual influencers. One of the most important things is that an influencers goals must align with your own campaign goals. Choose an influencer tracking platform. By the usage of an influencer tracking platform you can check the campaign performance and the influencers performance quite easily. 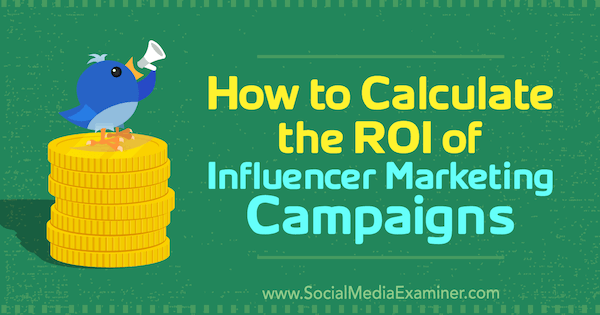 You will measure the campaign ROI in a simpler way. There are different platforms just like NeoReach, TapInfluence or Grin. Design your marketing campaign and measure the influencers. Pick an initial group of influencers for the beginning of the campaign. Do a tracking for each influencer’s performance at the start and take notes of their engagement rates for each of their posts. Finally compare your notes to the collective group of influencers. Be sure that the influencer you have chosen has experiences with using brands, products or services. So to sum up it is really important to do a right planning and execution in the beginning when you want a successful influencer program. With this 5 steps you can assess the program easily and improve the ROI from your collaborations. Fenomenler takipçilerinin satınalma tercihlerini etkiliyor mu?